Everything’s put on a growth spurt in the heat – the Purple Ukraine tomato in the greenhouse is already nearly as tall as me, and I’m not short! For next year I really should mulch the beds. They are so dry they are forming a crust on top and it is taking me ages to push the cultivator though. Plus as soon as I water it it sets again. I went to Hampton Court Flower Show last week – I love it there – it’s got a healthy sprinking of fruit and veg growers and it’s an easy ferry ride downriver. It was scorching hot, with clusters of people (mainly of a certain age) huddled under any tree offering a morsel of shade. Don’t know how they coped – my Mum would have wilted! We came away mostly unscathed, but in my case that was more because Blackmoor didn’t have any tayberries in stock. If they had I would have been spiked mercilessly on the way back from their thorns. As it was I now also have some more sweetpea seeds (for some reason this year’s flowers are pretty much only red), some onion seed (I am newly a fan of onions from seed) and a dwarf quince – with a quince on! Not quite sure where to put that either! My plot’s festooned with ladybird pupae and I think they are stemming the tide of blackfly. I tried hosing the beans on my munty frame, but it didn’t quite work and I had to spend a fair amount of time rewinding the beans back onto the twine. Not many of the ladybirds are native ones, which is a shame. 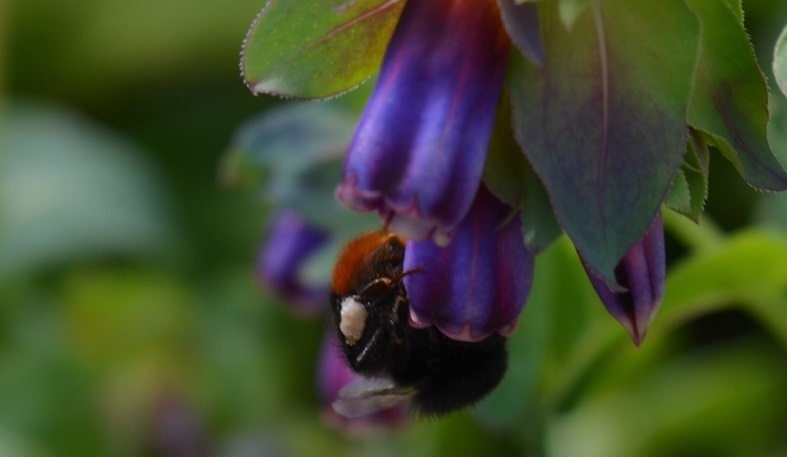 The cerinthe is still proving a huge draw for the local bumbles and I am so glad I grew it. It’s going to be a regular feature, not least because I’ve been told it self-seeds like a demon! I’ve been cutting some for the house too, as the flowers are so beautiful, and it just keeps on growing back. The bee pictures aren’t as crisp as I would like though – I think I might see if I can get a macro lens around my birthday. I’ve taken out all t he broad beans, which were hammered by the aphids. I didn’t get as many beans as I had hoped for, but still about 5 litres of podded beans – now in the freezer. 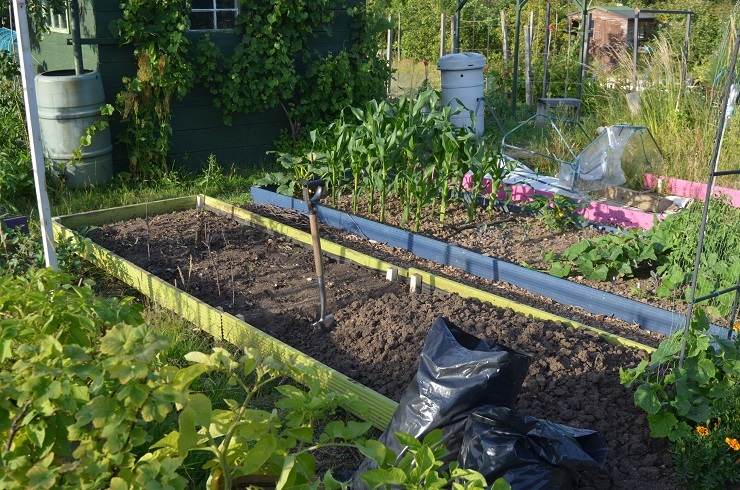 The whole bed now needs digging over before being planted with winter brassicas. The ground is very dry and really solid but thankfully my spade is very sharp. I have a few bags of rotting leaves to add to the soil when that’s done, and hope I can get that done this week before moving on to the saffron bed. My Bozeman watermelon is out of the greenhouse and into the ground – with what might be 3 mini-melons on it…fingers crossed! Katie and I dug up some potatoes to make space for the final 2 cucumbers and also some cosmos I have in pots, but unfortunately we weren’t quite quick en ough and she had to go home for her bedtime before we got it done. I have promised we’ll complete it tomorrow. So far I have 2 Potimarrons set, 1 Shishigatani and 2 Small Sugars. The Burgess Buttercup’s growing tip appears to have vanished (birds? it’s on an arch) There are about 6 fledgling Trombas on the 2 plants and I am looking forward to these – I hope to catch them in time to save seeds. Harvested: fennel fronds and some more Lady Christls and Pentland Javelins. Am seriously unimpressed with the PJs in comparison to Lady C – won’t be growing them next year (if I remember and don’t give in in £land! ).